Every year around this time, I take out my crockpot and get ready for the soup season. I can put all the ingredients - vegetables, beans, rice, liquids either at night before going to bed or in the morning before leaving for work and I have a big flavorful, bubbling pot waiting for me for dinnertime. With some buttered bread slices or a quick salad, this makes a delicious weekday meal when we are either running late from work, a stuck in traffic or just plain tired. In the slow cooker, food is cooked over low heat for a long period and retains all the nutrients and flavor. Since it also cooks at a lower temperature it also uses less energy. 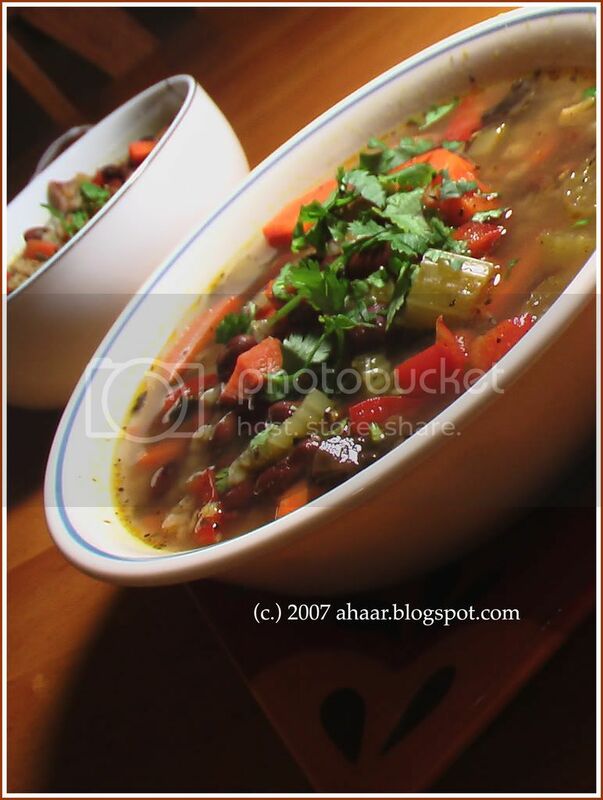 This week, I made black bean and vegetable soup. 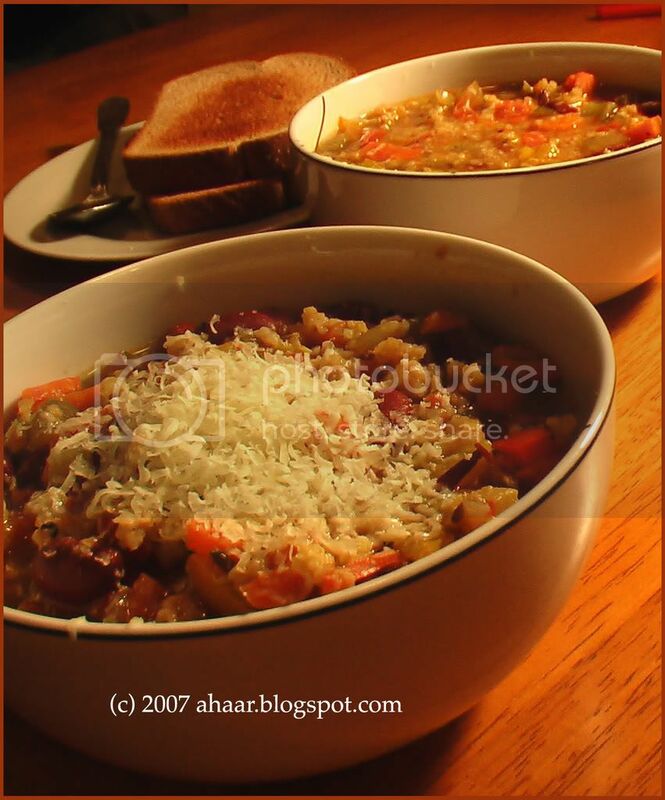 Here is a picture of the red kidney beans and vegetable soup I made last week. And last year I even tried Mulagatawny Soup in the slow cooker too. It turned out great! I like to slightly saute the garlic and the spices together and then add it to the crockpot. Add all the chopped vegetables and the beans to the slow cooker. Then add the spices, broth and water and let it cook. The one I have has only two settings high and low. I set it to ow and let it cook for 5-6 hours. This goes to Suganya at Tasty Palettes who is hosting November as Vegan Month. 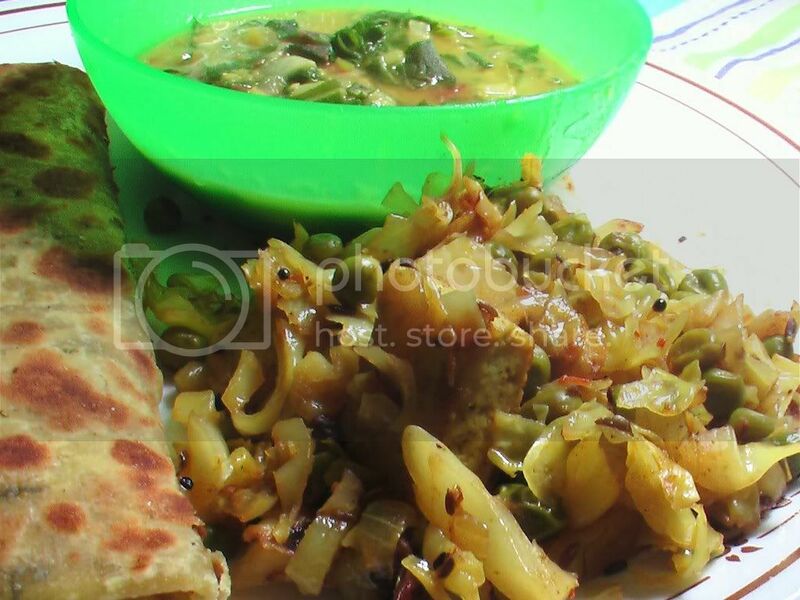 Cabbage Tarkari is a simple vegetable dish to make, after you have finished cutting the cabbage that is! My mom makes it quite regularly during winter from cabbage grown in vegetable garden. Somehow mine always turned out a little lacking. I asked my mom what her secret was and was determined to try it again... soon. So when I found some small cabbages at the Farmer's Market, I decided to try my hand at cooking Bandhakofir Tarkari. 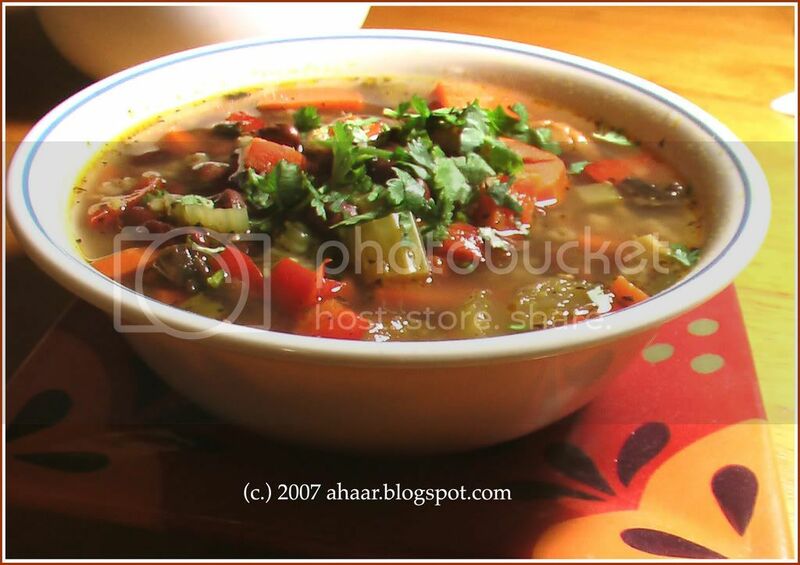 My Phisi would also add shrimp in the sabzi and it adds another layer of taste and texture. Since I couldn't add shrimp I sauted some Tofu and added it in and both Aswin and I enjoyed our new version of Tofu Cabbage sabzi. Cut the cabbage in small strips. Set aside. Saute the tofu till the Tofu becomes golden brown. Keep it aside. Heat half of the oil and temper it with asafoetida, cumin seeds, mustard seeds, and green chillis. Add the grated ginger and then add the chopped cabbage. Add the turmeric powder, coriander powder and let it cook on closed lid for 2-3 minutes. Then add the peas, water and let it cook for 7-8 minutes till the cabbage is almost cooked. Then add salt, tofu and let it cook on closed lid for another 2-3 minutes. Once all the water has disappeared, add about 1 tspoon oil and lightly saute it and mix well. Serve warm. 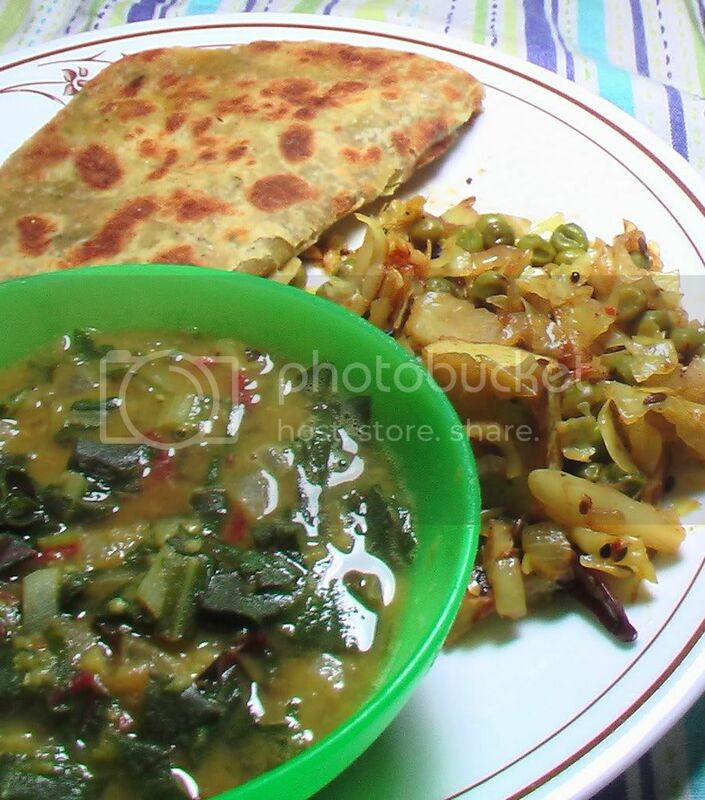 We enjoyed ours with spinach dal and parathas. This is my entry to Sunita's Think Spice... Ginger event. I hope she will accept my late entry! You haven't heard from me in the last few days because I wasn't cooking all that much. The lingering cough that started a few weeks ago developed rapidly into bronchitis and I had my first taste of major illness and ER in the US. It was also the first time I was going to a University Hospital instead of a clinic. And when the resident walked in, I couldn't stop comparing him to characters in Grey's Anatomy. Actually that is what we called him - Bailey! My food consisted of various dal soups which Aswin cooked for me and oats. That is all I could eat. But now that the antibiotics course is over, my taste buds are longing for more. 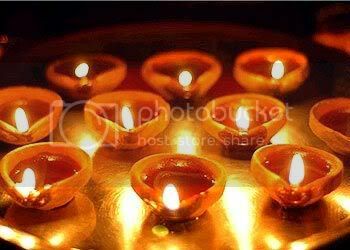 Inspite of all this, I did enjoy Thanksgiving at a friend's place. They made Salvadorian Turkey, Corn Tamales, cabbage side and we took Green Bean Casserole, Mashed potatoes, Pecan Pie and Carrot Halwa. It was lovely. It's cake time! 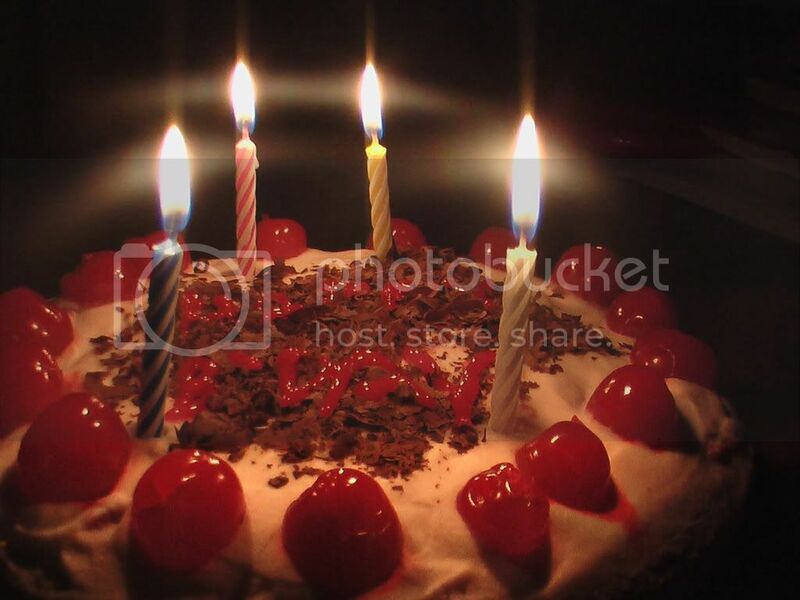 Last year at this time baked my first cake from scratch for aswin's birthday. So when the year did a full circle, I wondered about what to make for this year. I initially thought of Tiramisu, but didn't have enough ingredients or the time. 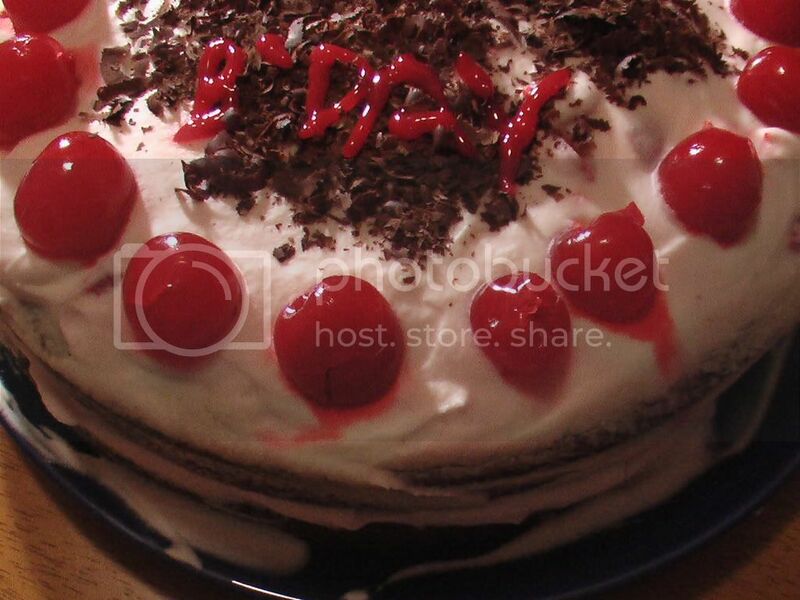 I settled on the next favorite cake - Black Forest but with some modifications. Usually, being the novice, I stay away from the decoration. But this time I decided to give it a try and wasn't disappointed. It did look and taste great! So now for the modifications. I didn't use cocoa powder in the cake. Rather I chopped a full bar of 100% cocoa (wow, that's bitter!) and mixed it in the dough. It gave a great texture to the cake. The chocolate shavings are also from the 100% cocoa bar. Also, I used brown sugar instead of white which gave some of the color to the cake. And I mixed some of the cherry liqueur in the whipped cream for some extra flavor to the cake. Preheat oven to 350 degF. Grease and flour two round pans. In a large bowl, mix flour, sugar, baking powder and salt. Then add the chocolate. Add the eggs, milk, butter and lastly vanilla. Stir till it mixes well together. Then add the hot water and mix for a couple more minutes. Then pour the batter on the pans and bake for 30-40 min till a tooth pick inserted in the center comes out dry. Cool for an hour. Mix all the ingredients till soft peaks form. Soak the cherries in the syrup. Take the full cherries out and set aside. Mix the chopped cherries with the cherry sryup. 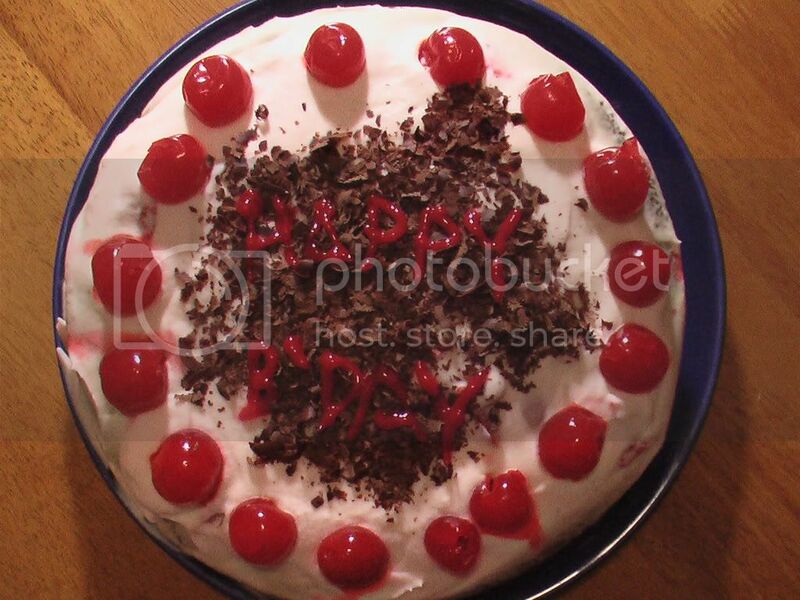 Sprinkle half of the cherry syrup and chopped cherries on the cake. Then spread the whipped cream. Put the second layer of cake on top. Sprinkle the rest of the cherry sryup and chopped cherries on top. Then top it with whipped cream. Add the chocolate shavings the rest of the cherries on top. Refrigerate overnight. This helps set the cream and the cherries. Thanks to Food Blogging my word bank, knowledge bank, recipe bank, spice bank, and friends bank have soared. I cannot even recall how many delicious discoveries I have made in last year and a half. Infact, It happens everyday! While I may have blogged about some (here and here), most of the time the food is cooked, oohed-aahed over and is gone in no time. Hema's Celery Thokku - Innovative, creative, unusual were the words that came to mind when I saw this post. Of course, I had to try it. It was quick and delicious. 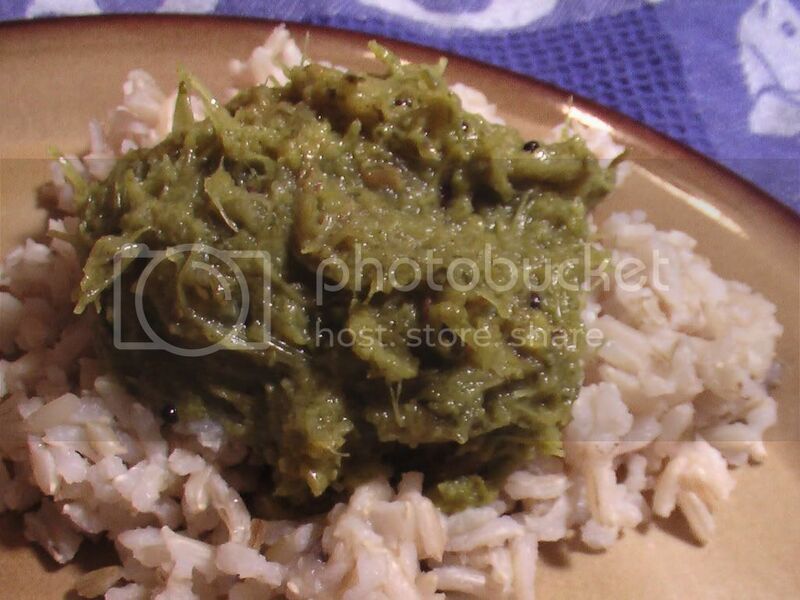 Manisha's Lime and Green Chilli Pickle - it was a big hit among friends and family. Everyone wants the recipe and I know I am making a bigger batch next year. Shaheen's Tilapia Curry - This quick and delicious recipe works for weekdays and weekends. Absolutely delicious. Thank you foodies, I love being a part of this vibrant community!